These wheels are the correct types for more traditional bikes using either the 28 1 3/8 ( ETRTO 622 ), 28 1 1/2 ( ETRTO 635) or 26 1 3/8 ( ETRTO 590 ) wheel sizes. Both front wheels without brakes and rear wheels with back pedal brakes are available, aluminium, chromed steel and chromed stainless steel. For the best appearance we recommend chromed stainless steel, but note that if you wish to use brakes which operate on the rim, aluminium offers a far more effective braking surface, especially in the wet. Please note that unless stated otherwise, these wheels are for side-pull brakes. 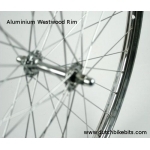 The 28 1 1/2 (ETRTO 635) size wheels with polished aluminium or painted rims are of the Westwood design and are not suitable for use with the more common type of brakes which operate on the side of the rim. 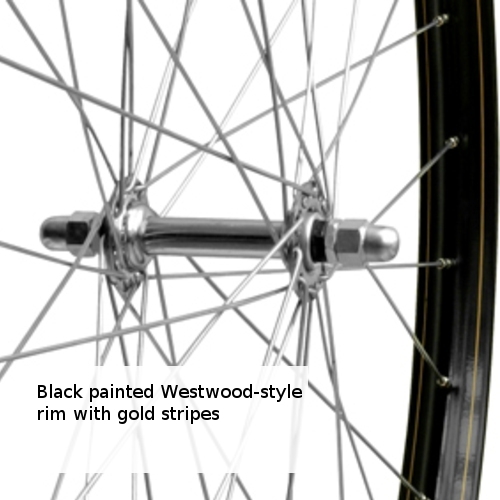 A few of the available rims have the Westwood profile. These are identified in the options. 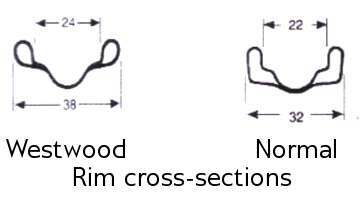 Note also that rim sizes shown on the right are illustrative only. 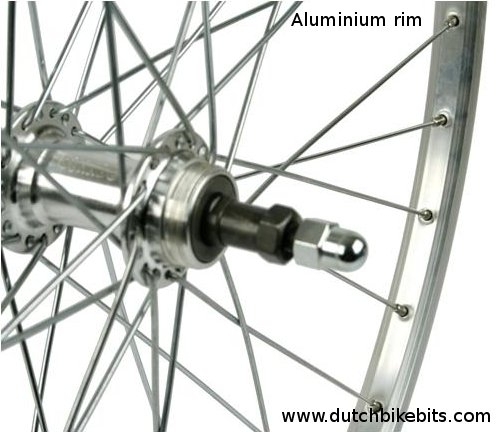 For instance, the aluminium rims for sidepull breaking typically measure 26 mm wide, this being the most common size. 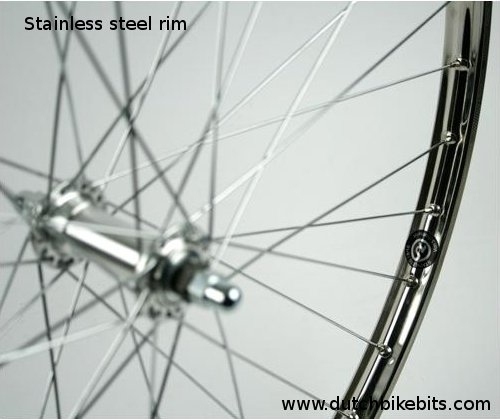 Note that "Steel" rims are of the same design as traditional rims made of steel, but these days they're actually made of aluminium. Therefore they will not rust. Different types of wheels vary enormously in weight. 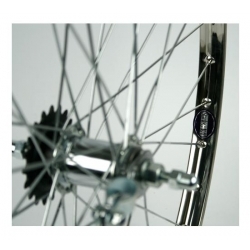 The cost of postage is correctly calculated for one wheel but the website may overestimate the cost for two wheels. If this happens then we will refund the excess. 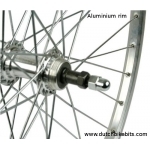 The rear wheels are designed for the traditional 110 mm dropout width. If you have a bicycle with a wider spacing between the dropouts then you will have to either squeeze the dropouts together (safe to do with most steel frames, don't do it with frames made of other materials) or use washers to fill up the gap. Some of the rear wheels include back-pedal brakes, also sometimes known as coaster brakes. These allow braking with the rear wheel by turning the pedals backwards slightly. Note that in many countries it is a legal requirement to have two completely independent braking systems on a bicycle and that therefore a bicycle which has only a back pedal brake is illegal. 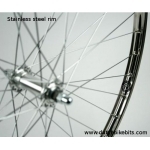 We offer a low cost set of parts to add a front wheel brake to most such bicycles. Make sure you have the right size! 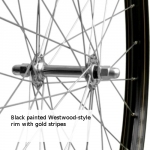 It's expensive to return wheels if the wrong size has been bought. For more information on wheel sizes and how to identify the correct size for your bike, please read our article on wheel and tyre sizes. The plain aluminium rims have hooked beads, meaning that most tyres can be run at a higher pressure (this is beneficial as it reduces rolling resistance) than was ever the case with steel rims and allowing use of tyres which are much wider than the rim. 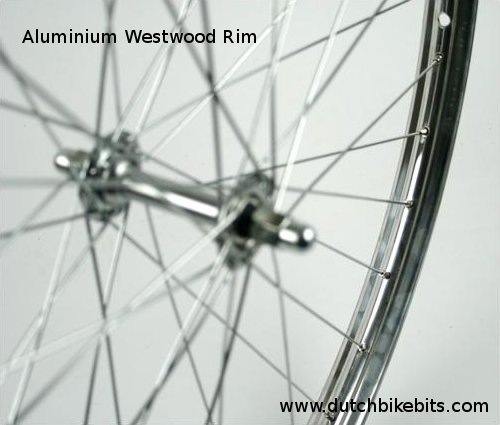 None of the steel rims nor the aluminium westwood rims have hooks and therfore you should keep tyre pressure relatively low and only use tyres widths of up to 37 or 40 mm on these rims.